A friend I used to work with back in my Edinburgh days has been working on some pretty fantastic stuff recently. He and his collaborators have been using computer-orchestrated electronic actuators to control a variety of physical music-producing devices. Their latest creation (shown in the video above) is Cybraphon, a one-"man" wardrobe band. This is a little helper class I whipped up to manage force feedback vibrations in XNA. The XNA libraries themselves just have a method you call to set the instantaneous left/right vibration force. In games, however, you generally want the feedback to last over a period of time, and you may have more than one force feedback event happening at the same time. This code provides a "fire-and-forget" interface for triggering vibrations. Add a call to update the ForceFeedbackManager in your game's update code. Call AddVibration whenever you want to trigger force feedback. Note: this code is not threadsafe - you must be triggering feedback from the same thread you call Update from. One of the problems I always have when I'm working on a game project is sourcing sound effects. Recently, I came across sfxr, a very nice program for creating sound effects. It was a great help when I was working on Saucer Pilots. It is basically a little software synth with a bunch of variables you can tweak to generate a wide variety of sounds. 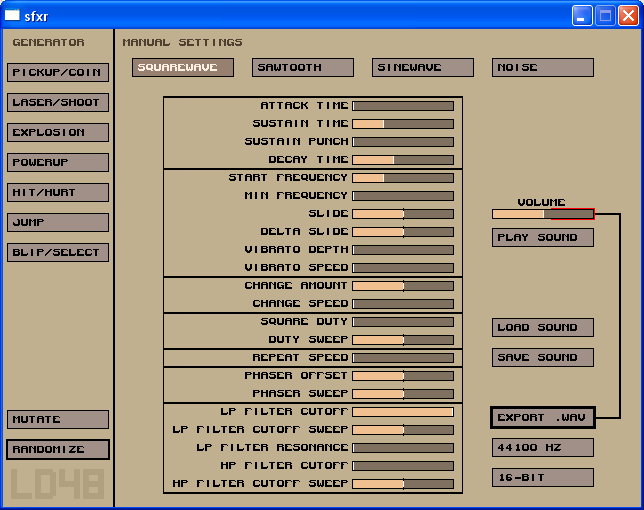 A helpful set of presets are provided for generating commonly needed classes of video game sounds. Once you find something you like, export it to a WAV file and you are good to go. Very handy little utility. Whew! I just squeaked an entry in under tonight's deadline for the 2009 XNA Dream Build Play competition. 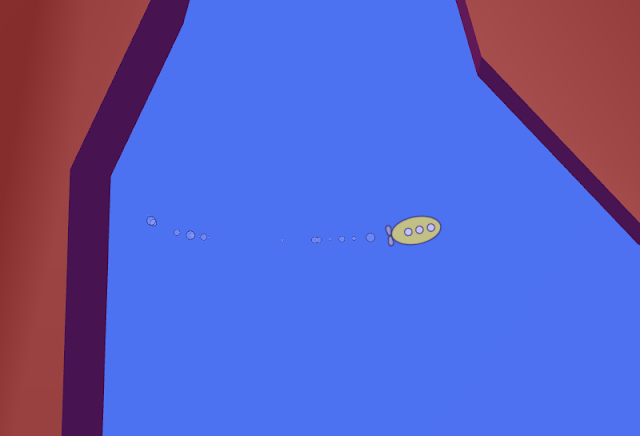 Last Monday, I was messing around with a new "flying saucer" game prototype idea. It seemed like it had promise, so I kicked into high gear to try to get something submittable for the competition. I initially got the submission date wrong, and thought I had until this Sunday. A few days ago, I realized my error and really had to step things up. Anyway, the game is "Saucer Pilots" - a 1-4 player saucer flying game with five different gameplay modes. Xbox LIVE avatars are used for saucer pilot models (avatars do not appear in this video, as they are not visible on the PC). The physics implementation I'm using is Farseer. Overall, I think it turned out pretty well for a week-and-a-half effort. The only thing that made that timeline possible was the framework on top of XNA that I've developed over the past year. And help from Sherry. Oh, and did I mention that it has fishing?